Dead Men’s Bones opening line: The pain is everywhere. 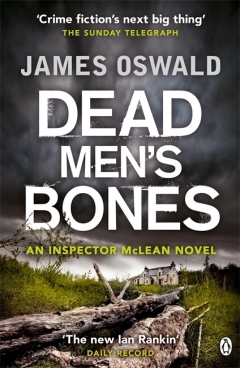 This is the 4th book in the Inspector McLean books, and follows on from The Hangman’s Song. Tony McLean is back at work, and investigating two seemingly unrelated incidents. On one hand he must try and discover how a very tattooed man ended up dead, naked and in the water, and on the other hand he is tasked to unearth why a man killed his family and then committed suicide. At the same time, his trusted colleague comes down with an illness for no apparent reason. It is only Emma’s postcards, and the cats that keep him grounded and safe. Under pressure to wrap up the case, McLean instead seeks to uncover layers of truth – putting the lives of everyone he cares about at risk . . . I really enjoy James Oswald’s way with words and this book was another great read. Now I need to read the first lot in this series, and look out for future novels. I can highly recommend this book. Looks like my kind of read – Tandy – thanks. Sounds like a great book Tandy! Nice review Tandy! You seem to read very quickly and make reading a priority which is a good idea. Perhaps that’s a new resolution for next year! I sometimes read a book a week! Don’t you read when you travel?